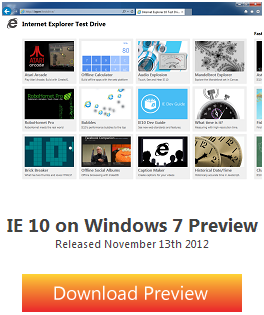 As expected, Microsoft has just released the Preview version of IE10 for Windows 7 32 bit and 64 bit PCs. The browser that comes preinstalled on Windows 8 based PCs and tablets is now also available for Win7 OS. Older versions of Windows, however, are not supported. It should be noted that this is just Preview release, final version of IE10 is expected to be released in 2013. Preview build is available to developers as well as to public for broader testing so that the critical issues can then be ironed out in final version. Head over to the page linked above, select the version (32 bit or 64 bit) and language of your choice, then click the download button. On Windows 7 32 bit, you will get IE10-Windows6.1-x86-en-us.exe file while on 64 bit OS, it will be IE10-Windows6.1-x64-en-us.exe. File name may vary slightly depending on the language of your choice. You can then install the exe on your PC. 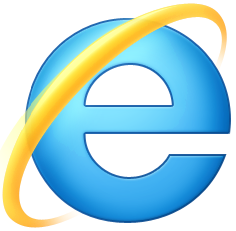 You may have to restart your PC after installing IE10, no surprises there :).